For more than 100 years, we have been dedicated to the study and preservation of the history of our town of Northborough, Massachusetts. Around here we like our history. 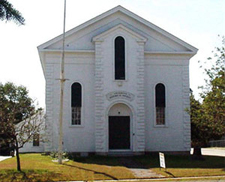 At the Northborough Historical Society we like history so much that not only have we been preserving Northborough’s history for more than one hundred years, but we have also been learning it, enjoying it, teaching it, and making it! When the Society was founded in 1906, Reverend Josiah C. Kent stated that "The facts of Northborough history should be collected and thus preserved from oblivion," and that is what we have been doing ever since. 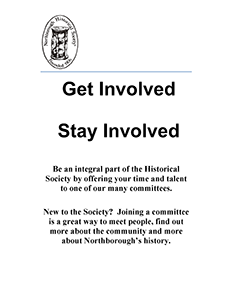 We hope you will consider becoming a member of the Northborough Historical Society and help us preserve and celebrate our town and its history. Find MEMBERSHIP INFORMATION HERE. Check out the wonderful map of Northborough's History: A Map Depiction created by Dan Fishbein, a Boy Scout in Troop 101, Northborough. As part of Northborough's 250th Celebration, 50 historic markers were placed around town to remind people about our local history. To learn more and visit these markers, go to this : website. Northborough Through Time, the "then and now" book by the Northborough Historical Society and curator Ellen Racine is available at LaLaJava, the Northborough Library and the Northborough Town Clerk’s office or by calling 508.393.2343 or emailing Info@NorthboroughHistoricalSociety.org. "Save the White Cliffs" on Facebook. Bylaws Amendment to be Moved for Vote at May 17, 2019 Annual Meeting. Check out the revised Bylaws HERE. presented by Bill O’Riordan, on Friday, April 26 at 7:30 pm. Contact the NHS if interested. made possible through a Grant from Mass Humanities. See what is available in our archive on this abbreviated index on local businesses and people from 1876 to 1903, and how this large company functioned by reviewing orders, sales, bills, products, and more. Join us and become a part of history!